Southcentral Foundation President/CEO Dr. Katherine Gottlieb playfully holds a handwritten sign indicating that the $25,000 check being presented to SCF Native Men’s Wellness Program Manager David Farve by Rasmuson Foundation President and CEO Diane Kaplan is a generous donation to the program given on behalf of The Harry and Jeanette Weinberg Foundation. The Rasmuson Foundation’s mission is “To promote a better life for Alaskans” and supports nonprofits that are focused and effective in the pursuit of their goals. One activity hosted by the Foundation occurring annually is the Rasmuson Foundation Educational Tour of Alaska for Grantmakers. The tour is an opportunity for nonprofi t organizations from around the state to build lasting relationships with national philanthropists. Robert T. Kelly, Jr., Chairman of The Harry and Jeannette Weinberg Foundation visited SCF during his visit to Alaska on one of these tours. The Rasmuson Foundation helped facilitate building the relationship between SCF and The Harry and Jeannette Weinberg Foundation. 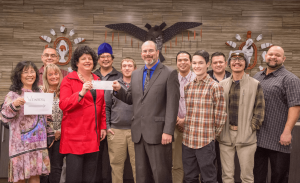 As a result of this relationship, Southcentral Foundation’s Native Men’s Wellness Program was awarded a $25,000 grant from The Harry and Jeanette Weinberg Foundation. NMWP helps men of all ages reach employment goals, embrace healthy living, and become contributing community members and leaders. This grant will aid in the program’s efforts to become fi nancially independent, and serve to further develop a program that provides training and jobs for its wellness interns.